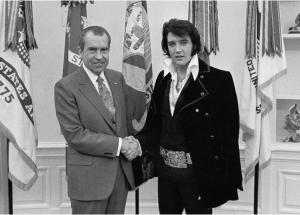 Elvis had a lot of honorary titles; the Tennessee State legislature named him an honorary colonel, and he famously met with Nixon in 1970, having previously written to the President that he would remain in DC as long as necessary to receive “Federal Agent-at-Large” credentials. In point of fact, he seemed to really covet police badges, of which he had a handful from various cities. Priscilla Presley wrote in her memoirs that Elvis particularly enjoyed pulling over speeding drivers (which he did with the help of a police light he’d acquired), flashing one of his badges, and warning them to drive more responsibly in the future.